If you haven’t done so already, register with ClearContext Online and link your Outlook account. Open another user’s ClearContext Online home page. For example, here’s mine. (Note: enable for public display on the preferences page). 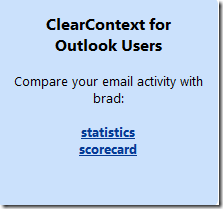 In the ClearContext for Outlook Users box on the right, click one of the links. From there, you will see a comparison between the two of you for all graphs on that page. 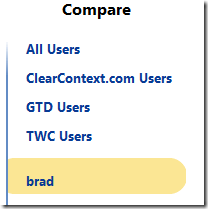 Once enabled, your colleagues can follow the directions above to compare to you. Posted by ClearContext Corporate Blog on August 25th, 2009.